Good morning. About six months ago, I finally satisfied a curiosity about the musical “Hamilton” which had been brewing for a little while, at last succumbing to the hype by purchasing the original soundtrack (I will probably never see it performed live in any Broadway-scale capacity, or if I do it will be a decade hence). I listened to it a few times, then daily, then all the time. Then I bought Chernow’s book. I brought the book with me to my weekend getaway to Port Townsend in July, intending to start it there while on my vacation. My first night in my hotel room, I cracked open the 800-page biography. It grabbed me and didn’t let go. I finished it in exactly 30 days (bear in mind I have two daughters and not a ton of time to sit around reading). I read it so voraciously that its massive weight caused a strain in my wrist. And I got the paperback. Anyway it’s been downhill from there. After finishing “Alexander Hamilton”, I read the book of his writings. Or most of it. Then I found the founders archives online. And so on and so forth. I am all in. I have a new passion and it has consumed me wholly. The interesting part of all this is that while I still enjoy the musical of “Hamilton”, it has fallen to the wayside. I appreciate it for what it is, but I now understand that it’s only a jumping off point. I now understand that it is absolutely riddled with inaccuracies. I mean almost every song contains some kind of non-fact. I guess I get the reasons why this was done, but this play is being heavily consumed by kids, and I hope they know that a good history book will clear up the real story for them. I hope they use it the way I did, as a gateway into research. The other thing that happened is that while my newfound interest started with Hamilton himself, it quickly spread to curiosity about early American life, the role of women in that world, and the many other people who were involved in the founding of this country. Like for instance, Marie-Joseph-Paul-Yves-Roch-Gilbert du Motier, Marquis de Lafayette. He loved this country so much that he came here illegally to join the Revolution and fight for free. 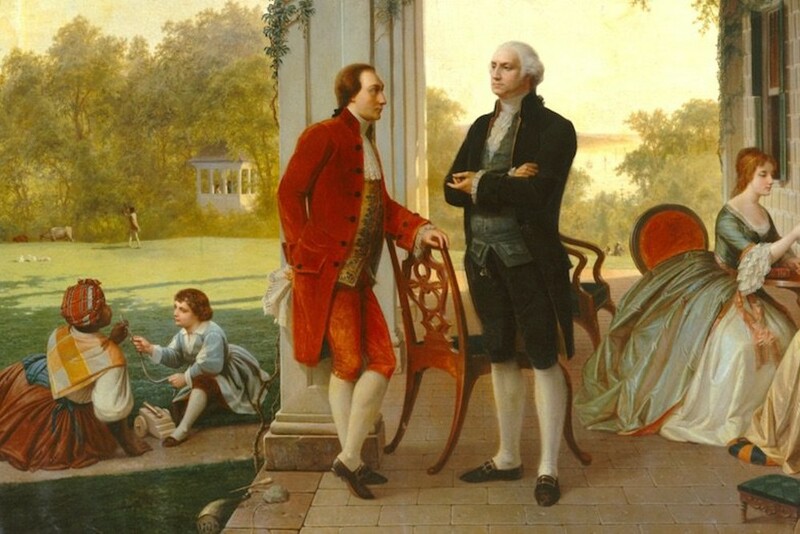 Here he is hanging out at Mount Vernon with his surrogate father, George Washington.